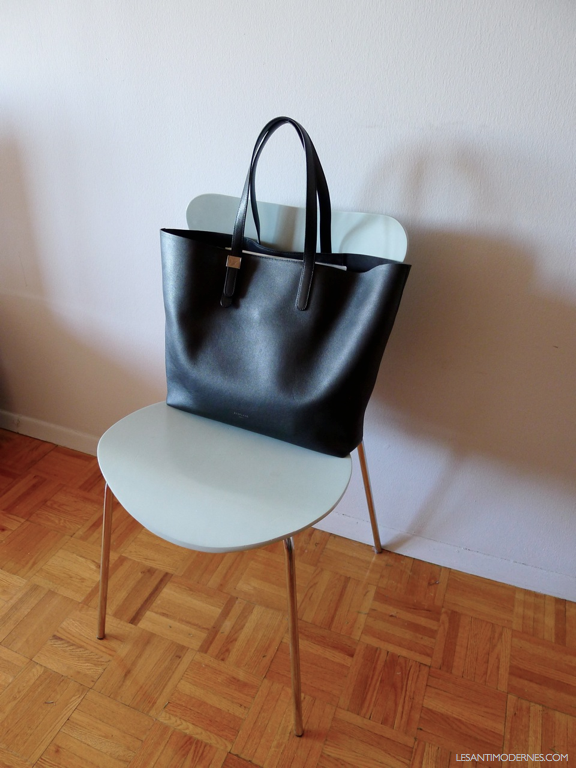 my everlane petra tote arrived the other day. i must admit, i didn't know what to expect when i placed my order. i'm very picky when it comes to leather accessories and bags, and was a bit wary of all the waitlist hype when the collection initially launched. well, the bag shipped rather quickly, and it's a beauty. i also considered the magazine, but ultimately decided to go with the market as it's the same size as my longchamp tote – big enough to stash everything i'd need during the weekday without being massive. the leather: thick and smooth with a very fine grain and a subtle sheen. 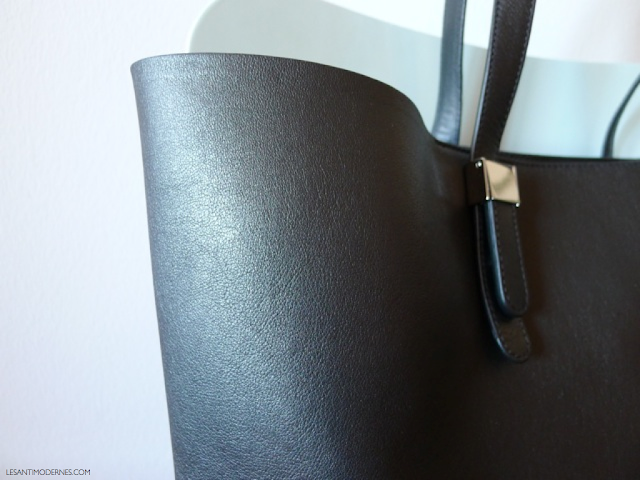 (i briefly considered mansur gavriel, but i think the leather finish is a bit too rigid for my liking.) 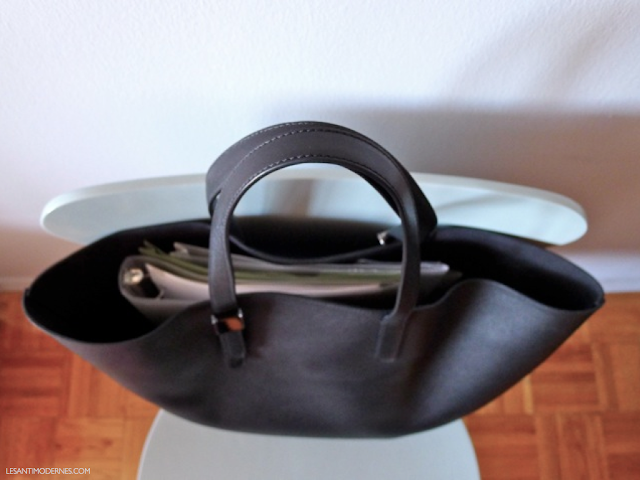 i wanted a tote that was structured yet still had softness and a bit of slouch. the everlane leather has the perfect amount of both. it'sits' well, and with a bunch of my stuff in it the base of the bag doesn't sag. the design: i think the design team did a really great job here with thoughtful details. the shoulder straps have three notch-length options, and the silver hardware buckle on each side clicks open and closes easily to enable adjustment. there are also four small but sturdy silver studs at the base to protect the bottom and help the bag stay upright when you set it down. i love the clean lines and form-after-function hardware. the craftsmanship: impressive, especially for this price point. the stitching is straight, even, and tight, the hardware feels solid. the edges are finished, and the seams and interior pockets are well made. the space: there's enough room to comfortably fit all the usual suspects: my 13" Macbook Pro, folders and files, large bag organizer, a full-size umbrella, a large water bottle or travel mug, a spare pair of flats, etc. the look: quiet luxury all the way here – this is a bag that looks a lot more expensive than it is without screaming 'status bag'. worth it? yes – definitely my top pick if you're looking for an affordable and sophisticated minimalist leather bag for work and weekend. 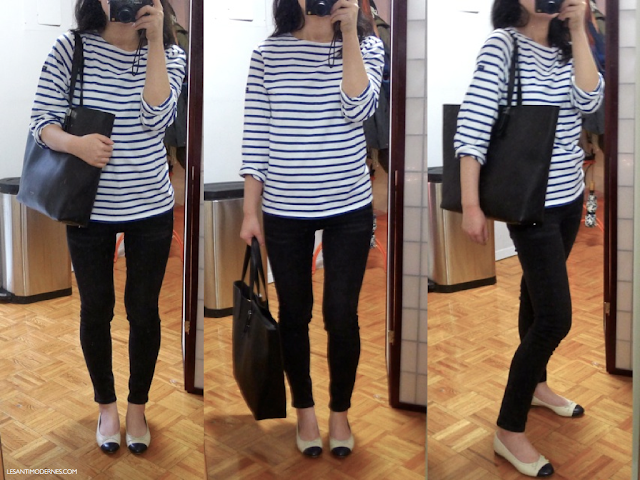 i hope this review is helpful for those of you shopping for a luxurious yet affordable tote. what do you think? do you have anything from the petra line? update March 2014: after two months of everyday wear. don't mind actually as the adjustable shoulder straps allow me to carry the bag close to my body. given that all my other bags have a top zip of some kind it's handy to have one simple tote! Thanks so much for this review. I was in the same boat and kept debating whether or not to purchase this. Based on your review I'm definitely pulling the trigger. Thanks again! yep- lined in suede, feels soft but pretty durable. Yes, thanks for this review! I'm kind of interested in the kiwi color but am worried that it's a bit nondescript. joyce, i think the kiwi is a lovely neutral - especially chic for a larger bag. I appreciate this review — I'm interested in the Magazine, so thank you for all the details about the different elements — but I must admit that what I'm most curious about is where you got the bag organizer you mention! Muji, of course. Thank you! I love this tote. I just bought a new bag, so I'm not in the market. But damn, this would be so useful. I use my Everlane backpack everyday for work and will now check out the Petra. My backpack has not shown any signs of wear and tear and it offers plenty of space. looks like a handsome bag with a thoughtful and functional design. I also like how simple the design is, some bags just have too many bells and whistles these days. Looks lovely. I picked up a tote from Marni for a song last year - which is my go-to tote (I particularly love the fact that it came with a handy detachable pouch - perfect for keys, cards, etc). i didn't realize that the straps were adjustable. super useful! I'm waiting for the day that Everlane starts shipping to the U.K. My only concern is the U.K customs. They're horrid and charge an absolute fortune for even the cheapest things. Maybe I'm misremembering, but I thought you'd said a while back that you were holding off on Everlane's leather bags due to concerns about the quality -- I know some have said their sandals stretched out, and there have been general quality concerns with other first-runs in their line. What made you change your mind? also i haven't had any quality issues with the tees and cashmere and silk blouses i have, and it's been almost a year now. their customer service is quite responsive to quality issues so i feel confident there. Oh this is a great review, I'm looking for a simple black work bag. I do think I would be better off with a closure, though. Thank you so much for the great Review. Is this bag heavy? I have the Petra in the smallest size in Kiwi and I love it. I went to their NYC event at the LES Tattoo Parlor when they launched the Petra and actually got to meet Petra. She's their main designer, very cool stylish woman who lives in Bed Stuy. I agree with everything you said; it's a terrific bag. Especially with the whole exclusivity PR campaign in the beginning, I'm surprised you don't see more of them in NYC. yep - the bag itself isn't heavy but the leather has a nice substantial feel to it, which is great. I also love these J crew kiki two tone flats. There are perfect shape (made in Italy) and perfect on you too. Thanks for your review! The Petra collection looks beautiful and I'm debating betwreen getting the Magazine or the Market. Just a question - how tall are you? I'm quite petite (158cm/5'2") and am worried the Market would overwhelm me. Thank you for sharing! I am just wondering whether your shoulder feels heavy or hurts when carry a Macbook Pro inside the tote. I am looking for a bag for laptop with style and also comfortable. Now I am considering the market tote or magazine tote. hi lily - the bag itself doesn't weigh a ton empty, so it won't add unnecessary weight even if you tote a laptop. i prefer the market just for the extra space, but hope this helps! Yes how tall are you? Deciding what size I should get...market or magazine. I'm 5 feet 1 inch. Hi! Question about your Saint James t-shirt ... are you wearing the Meridien or the Minquiers? I remember seeing a blog post a while back that said you preferred the Minquiers but was wondering if you tried a different style. I've been using this bag for several months now and I quite like it. The leather is thick and seems to hold up well. I bought the black magazine style. Great review! Thank you! I just got "waitlisted" for the black Petra Market. Do you happen to know how long people are usually on the waitlist for before being invited? Great review! I just got waitlisted for the black Petra Market Tote. Do you happen to know how long people are normally on the "waitlist" before being invited to buy the bag? Thanks so much in advance! Hi, i'm thinking of purchasing this bag. Could I ask what is your height as I'm quite petite and am afraid this bag would overwhelm. Thanks!